Last week, we shared the first part in our series explaining how Michigan cities were named. This week, check out part two, which shares the story of how five more states were named. How the name of Michigan’s capital city came to be is a fun story. In the 1830s, two brothers from New York tried to scam their fellow statesman by going to Lansing, New York, and trying to sell plots of land in an area of Michigan that was underwater most of the year. When men who bought plots of land realized they had been scammed, they settled in the area that is now metropolitan Lansing and renamed the area “Lansing Township” as an homage to their home village in New York. 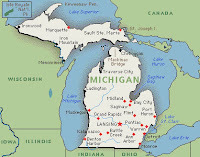 In 1847, the state constitution required that the capital of Michigan be moved out of Detroit. Lansing Township was chosen out of frustration with the process. 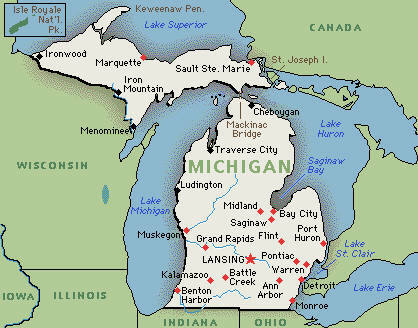 In 1848, the area was eventually given the name of Lansing. From November 9 – 17, check out the Lansing Film Festival, which will feature foreign films, documentaries and student productions from around the world. Surrounded in mystery and legend, Petoskey is said to be named after the son of a French fur trader and Ottawa princess. He was named Petosegay. The translation of the name is “rising sun,” “rays of dawn,” or “sunbeams of promise” due to the bright light that shone on his face near the Kalamazoo river when he was born. He was a successful merchant and trader, who also married an Ottawa princess. It’s said a small settlement was started on his land just a north of Bear Creek and was named Petoskey (an English translation) after him. Petoskey is known for its bike trails, including Little Traverse Wheelway, a 26-mile stretch that follows the shoreline from Charlevoix north to Harbor Springs.